Nashville, Tenn. (Jul. 30, 2018) – Globally recognized magic powerhouse Justin Flom will unite with Compassion International for a family friendly night of wonders, thrills and excitement on the upcoming “Make Magic Share Joy Tour.” The television and celebrity lauded magician will be bringing a special night of up close action alongside a personal sharing of how a bold step of faith changed everything. 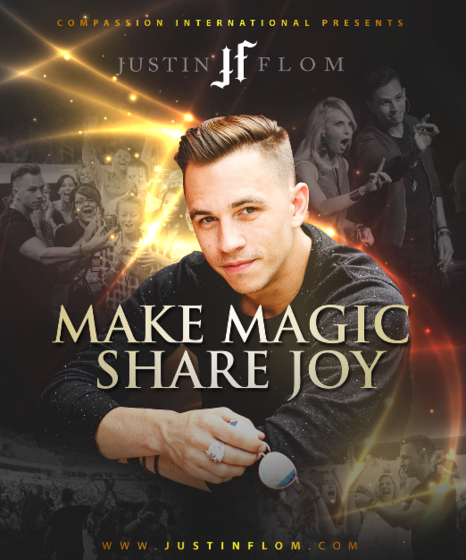 The “Make Magic Share Joy Tour” will visit multiple markets including stops in Michigan, Florida, Tennessee, Wisconsin and more throughout Sept. and Oct.
Tickets for Justin Flom’s “Make Magic Share Joy Tour” presented by Compassion International will go on sale Wednesday, Aug. 1. For more information visit www.JustinFlom.com. ** Additional dates could be added, check www.JustinFlom.com for the latest. Minnesota born and resident of Las Vegas, Justin Flom is building a Magical Career. From touring with Country Superstars Florida Georgia Line and creating magic for other stars including Lady Antebellum, Super Bowl Coach Pete Carroll and the entire Seattle Seahawks team, John Legend, Nick Jonas and Chrissy Teigen, Flom finds himself in front of as diverse an audience as any entertainer. His tours take him to buildings like Madison Square Garden to mega-churches as well as amphitheaters in more than 26 countries around the world. Whether appearing on Ellen, The Today Show, Racheal Ray, Network Late Night Shows, with WWE Wrestling stars or on his own show for 2 seasons on SYFY, Wizard Wars, Flom has found that he loves the camera and the camera loves him. In addition to national shows Flom has also starred in various commercials for Coke, American Airlines, CMT and Kellogg's while co-authoring a book on his life called "Adventures Of A Kid Magician."